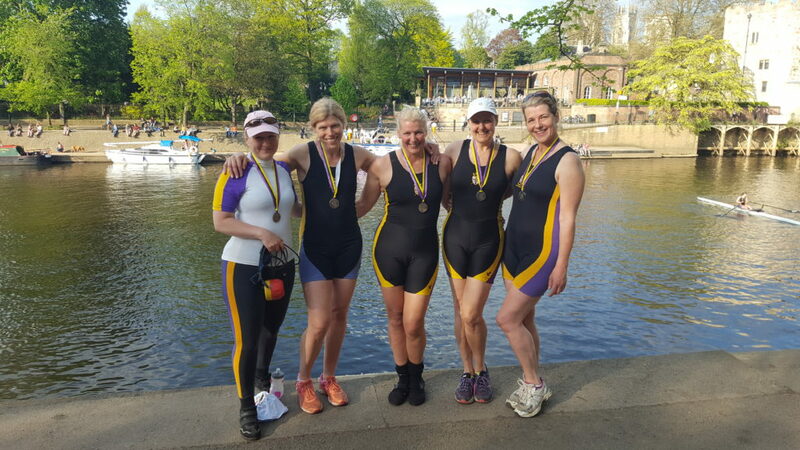 York Spring Regatta 2018 Success. The sun shone brightly on York Spring Regatta this weekend, bringing summer racing on the Ouse to the heart of the city on Saturday 5th May to kick start a glorious bank holiday weekend. Racing over from St Peter’s Boathouse to just above the YCRC boathouse, the regatta draws competitors from across the region and further afield, with 20 clubs competing in this year’s event in over 180 different crews over 9 hours of racing. Run entirely by volunteers from YCRC and further afield, the regatta served up some wonderful racing for those who by the evening had lined the banks of the Ouse to cheer them on in the sunshine. It was a great day for YCRC – across the 56 events offered over different boat classes and ages, the club rowers took home 36 wins, with successes for Junior, Senior and Masters rowers alike, from close races to emphatic victories. Anne Homa, Regatta Secretary, said “It was great to see rowers from all sections of the club, many racing for the first time ever, enjoying racing good opposition in fantastic conditions”. Thanks to all who helped out, and see you on the 24th June for York Summer! The winning WMasC4+ York Spring 2018: Steph, Anne, Anna, Philippa and Lucy. Photo: P. Press.